Lactose intolerance and dairy allergy is widely misunderstood – so I interviewed Rose, mother to three-year-old Sadie who has an egg and dairy allergy to help unpick nutrition facts and myths. Slow down – what’s lactose intolerance? When your child’s body doesn’t have enough of an enzyme called lactase, they may experience difficulty digesting the carbohydrate in milk and dairy products called lactose. As a result, lactose remains in the gut undigested. Bacteria that naturally live in the gut go onto feed on the lactose, which can produce a lot of gas, bloating and discomfort for children. 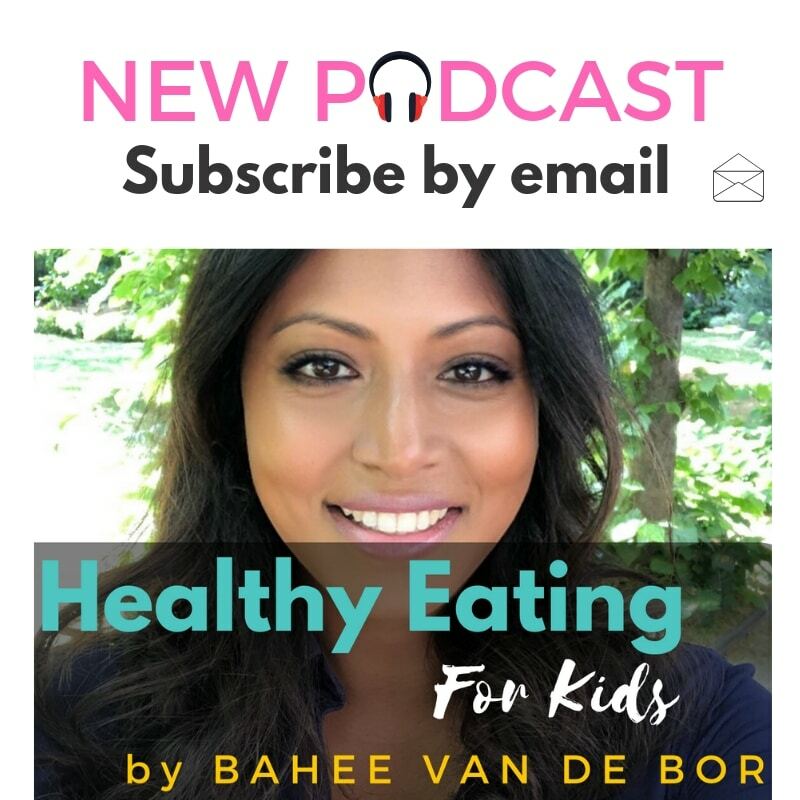 ARE YOU LISTENING TO HEALTHY EATING FOR KIDS PODCAST? Would my child need to avoid cow’s milk and dairy? 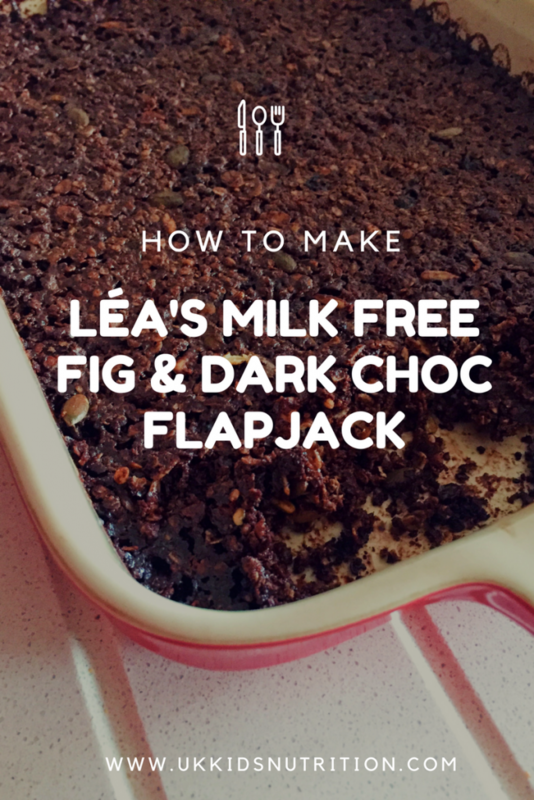 Unlike a dairy allergy whereby children have an allergic reaction to the protein found in cow’s milk, your child will not need to avoid dairy entirely. The amount of cow’s milk or dairy products that your baby, child or adolescent will tolerate can vary. Most children will be able to tolerate and enjoy small amounts of cow’s milk and dairy products when eaten as part of a meal spread out over the day. For example, up to 120ml of milk, hard cheese and yoghurt can be eaten in small quantities spread through-out the day to help meet your child’s daily requirements for calcium. Speak to your GP or paediatrician if you suspect that your child may have lactose intolerance. Your doctor can then organise a lactose intolerance test (blood test, breath test or stool acidity test) to help establish a diagnosis. In this podcast episode Rose introduces us to her daughter Sadie, who has an immediate IgE mediated dairy allergy. She initially presented with dermatological symptoms such as facial swelling and red hives. This basically means that Sadie’s immune system has an abnormal reaction whenever she is exposed to dairy or cow’s milk protein and presents with swelling and hives on exposure. Her symptoms are immediate and different to lactose intolerance. Unlike lactose intolerance Sadie initially couldn’t tolerate small amounts of dairy and needed to follow a strict milk free diet. If your child has a medically confirmed dairy allergy, the treatment is a strict dairy free diet. In this podcast episode, Sadie describes what happened to her when someone gave her the “wrong” milk which caused her to vomit (or be “milk sick” as Sadie calls it) before experiencing red swelling. Interestingly, “this was the first time that she showed gastrointestinal symptoms” said Rose. Another reason why lactose intolerance and dairy allergy can be confused. The symptoms can be similar but the cause for the reaction is entirely different. Speak to your doctor, expert and a registered paediatric dietitian as soon as you can. Your dietitian will help you navigate through the supermarket shelves when you are on the hunt for milk free food. There’s an art to reading labels to determine whether a food contains cow’s milk protein or dairy. Some foods contain hidden amounts of dairy therefore it’s important to learn how to read the back of packets and its nutrition labels. 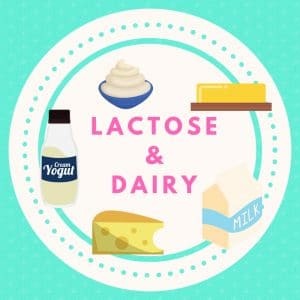 Foods containing lactose that can be enjoyed in small quantities for a child with lactose intolerance would unfortunately need to be avoided for a child with a dairy allergy, so it’s crucial that you know how to identify hidden sources of cow’s milk protein in the ingredients list. Be prepared to feel overwhelmed at first, but after a couple of weeks, reading labels will be like scrolling through the news feed of a social media channel. Easy peasy basically. Remember, common allergens do need to be clearly highlighted in nutrition labelling which eventually makes label reading effortless. Check with your dietitian whether your child needs to avoid foods labelled as “may contain traces of milk”. Often this warning is displayed when a food item has been prepared on the same tray line as another product which contains dairy as an ingredient. For children with very severe reactions, this may be necessary, however, this may not be the case for all children. Try not to panic. Other people including well-meaning family members may not necessarily understand the difference between lactose intolerance and a dairy allergy due to the similarity in symptoms. People often mean well and are eager to offer advice but remember that after a few sessions with your dietitian, you will be armed with tonnes of information. You will become an expert when it comes to your child’s nutrition. It can hurt when friends or family members don’t believe your child’s diagnosis such as a dairy allergy. Some people even find it hard to believe that lactose intolerance is a genuine medical diagnosis! 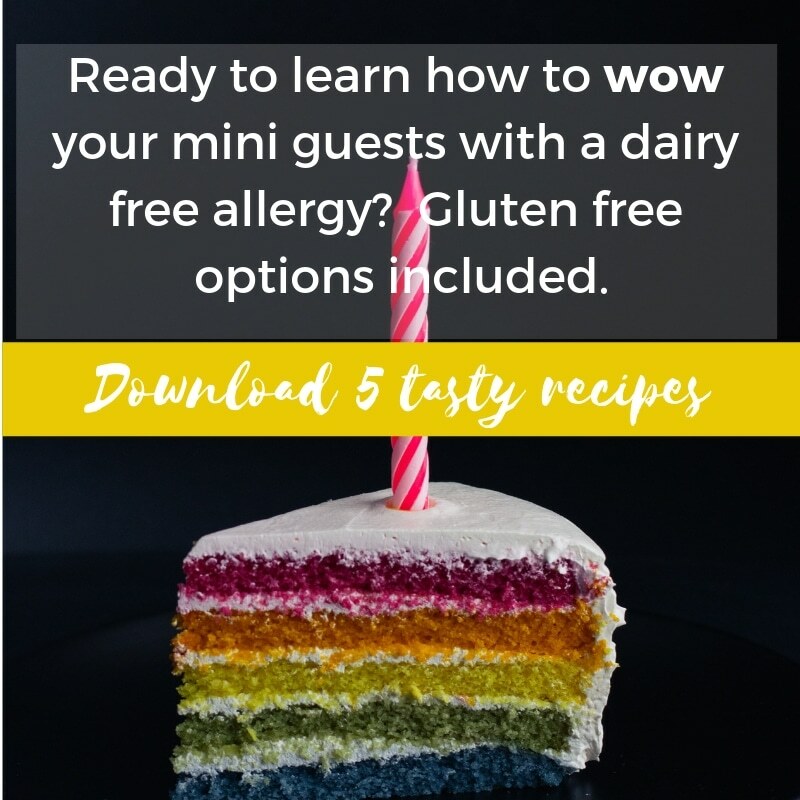 Speak to your dietitian for tips on how you can explain to loved ones what a lactose intolerance or milk allergy is in an easy to understand language (or divert them to this blog post for essential reading). Keep it flexible. Even as a busy parent with time restrictions, think about batch cooking. It can be super helpful. Once a week at a time that suits you, cook a few portions of meals that you know your child enjoys eating and pop it into the freezer. 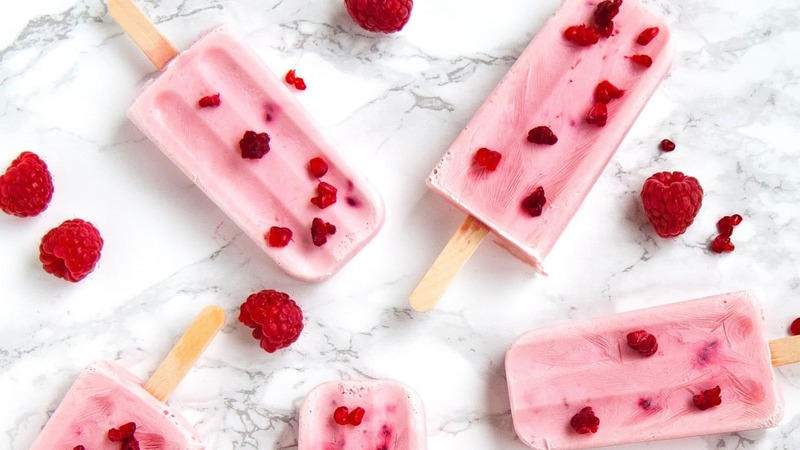 Become familiar with dairy free and egg free snacks (if your child is also allergic to egg) and keep a good supply at home or in your bag for when you are out and about. Freezing home-made dairy free and egg free muffins for snacks after nursery or school can also be handy for you and the kids. Remain calm when family members say “Can she not have a bit of cheese”? Feel free to remind others what happens to your child if they do accidentally eat dairy. Is soy milk harmful for your child? Do speak to your dietitian about whether soya is a suitable alternative to cow’s milk for cooking or as a main drink. A small percentage of children can react to soy if they are also allergic to dairy. A popular misconception is that soy milk can cause infertility and contains oestrogen. In reality, with the exception of babies under the age of 6 months, soy-based infant formula and soy milk can be given safely from 12 months of age, particularly if they are also following a plant-based diet. Do check that the brand you choose is calcium fortified, has added B and D vitamins. To build variety into your child’s diet and if you are still worried about using soy, do check out the healthy competition. There are a variety of plant drinks available on the market today but only a couple are appropriate for toddlers as a main drink. In this blog post I’ve reviewed at least five different types (see “how to choose a dairy free milk on a plant-based diet”. To build variety in your child’s diet). 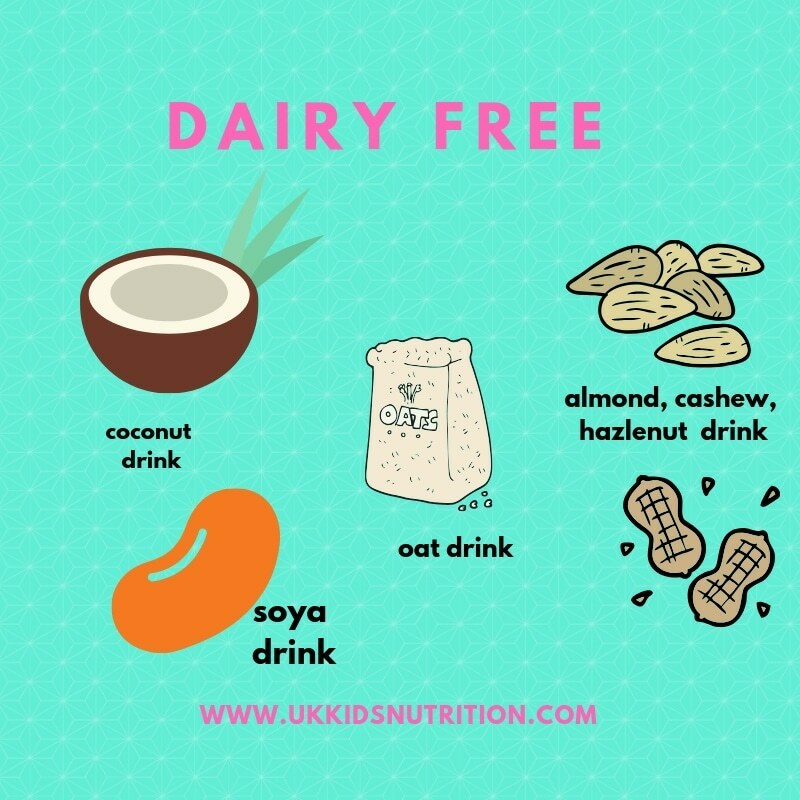 You could select one type for cooking and another as your child’s main dairy free drink if you prefer. Make a nutritious choice for your child by offering a range of calcium fortified products such as soy, oat or coconut yoghurt type snacks. Try not to fall for the internet trap that soy is a carcinogenic devil. Soy is not a carcinogen. In fact, soy milk does contain phytoestrogens such as isoflavones which is present in higher quantities compared to other plant-based drinks such as almond milk or coconut milk. Breastmilk does contain isoflavones but the amounts are significantly smaller in comparison to soy milk. Although phytoestrogens are thought to have oestrogen like activity, once consumed and in the body, these actions are thought to be “weak” and biologically inactive. The literature reassuringly describes reports of children who have grown up drinking soy-based infant formula to be perfectly healthy and thriving. Consumption of soy isoflavones has also been studied in relation to breast cancer prevention with the majority of studies showing either a protective or no harmful association. With the support of your dietitian and allergy team, children can be challenged using a milk ladder. For children with immediate or IgE mediated cow’s milk protein allergy, it’s best not to proceed with the milk ladder at home without prior agreement as skin prick testing may need to be organised first for children with moderate to severe dairy allergy. For children with lactose intolerance, you may find that children are gradually able to tolerate bigger quantities of lactose but this will vary from child to child. Always chat to a registered paediatric dietitian if you are unsure. It’s tempting to make changes to your child’s dairy free diet based on what you read online or after a casual conversation with a friend. My advice? Speak to your paediatric dietitian / children’s nutritionist about whatever’s on your mind. 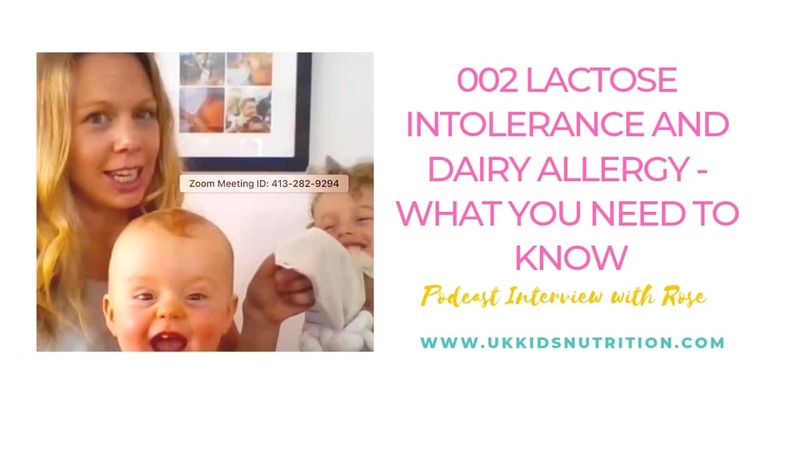 Chances are, after a conversation with your nutrition expert you’ll have clarity, peace of mind and confidence that you are making the right decisions to support your child with lactose intolerance or a dairy allergy.